I think I now finally understand why the unicorn is the symbol of the Boston Marathon - a magical race deserves a magical representation. April 15th was a magical day of running for me. 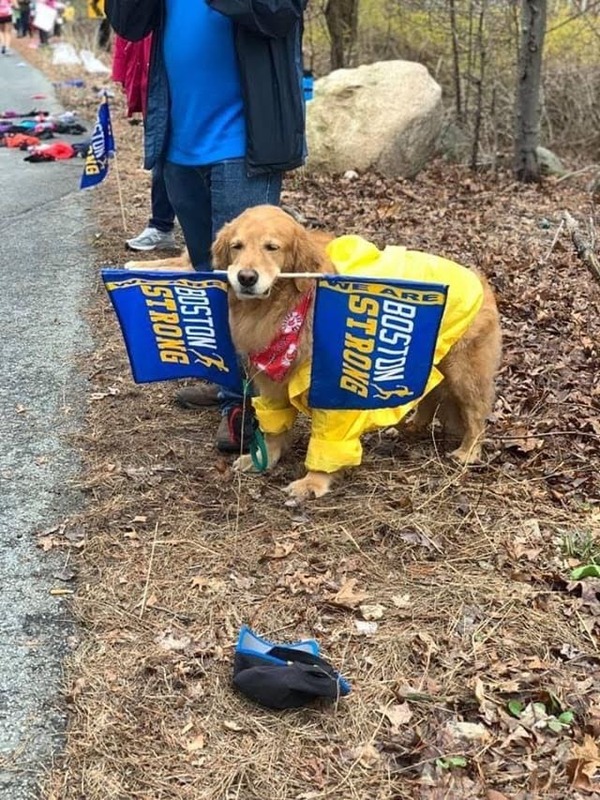 I had planned my race outfit well in advance for this year's Boston Marathon. I loved the crop top from Mama Bear Runs Marathons for the Chicago Marathon so when she released a Boston design I was all in! I also wore the Oiselle Flyte Shorts and totally understand why Allie Kieffer loves them! Tiux gave me awesome crew socks that matched perfectly and my Koala Clip was better than I imagined to store my phone! I didn't even know it was there! I had no clue if it would be hot, cold, sunny, rainy, snowy, etc. but my white Road Hammers Ciele hat is my favourite! And of course my Mizuno Wave Riders 22s were a must. ... I did not end up using gloves or arm bands with the heat. On race morning I set the alarm for 5:00 a.m. and we also called for a wake up call. When I answered the wake up call the lady on the message said, "Good morning, it's your wake up call for Monday, April 15th. Today's weather is overcast with late day sunny skies and a high of 27 degrees." I chuckled and said to Matt (as the rain poured outside our window) "Ha, they left the message on the recording from yesterday!" Little did I know that WAS the weather for Marathon Monday...uh oh. After the 2018 Boston Marathon everyone came this year prepared! Our suitcases were bursting with gear for cold, wet, windy, snowy, hot, you name it running! This was the forecast I saw as I was getting ready...don't freak out, don't freak out LOL. I do not run well in the heat! I tried not to obsess over the weather and got my Christine-Inspired Mantra ready for the race. This was an awesome reminder for me during the Chicago Marathon so why change it! Okay, I'm ready to go! Marg had a genius idea to save our socks! We put bags on our feet under our old shoes that we'd ditch! It was so clever!!! Last year we almost broke our necks walking around on wet soggy grass with bags on the outside of our feet, lol. Tom was probably tired of us saying "take our picture!" LOL. The rain poured and the thunder crashed as we headed from Newton out to Hopkinton. It was very warm out so I didn't mind the rain honestly. Marg, Matt and I hung out in the Athlete's Village on our little make shift poncho mats since they took my workout mat that I tried to carry in to sit on. We had coffee and headed back and forth to the bathrooms. The line ups kept growing and growing! The rain stopped and it was so muggy out. I couldn't believe how warm and humid the air was after a winter of frigid running. I was hoping this would bode well for my lungs that very strongly dislike the cold air, yet I was fearful of how my body would respond if the sun came out. At 9:50 I left and headed up for the start of Wave 2! I was excited and nervous yet sort of calm. It was weird. I think because my expectations were low after a rocky training cycle that my mind actually just wanted to go get this done and see what the day would hold. During the walk down I changed into my racing shoes and ditched my throwaways. I ran into Pat from Halifax and we headed down together to the start. It was great to chat on the way. I searched for Charlotte and Doran in our corral but no luck. :( Then I heard Kenzie yell out my name and it was nice to see a friendly face at the start. Remember Kenzie from the Cabot Trail Relay? He gave me his clothes when my team got locked out of my car after my leg and I was frozen! Unlike other years I felt more at ease at the start. 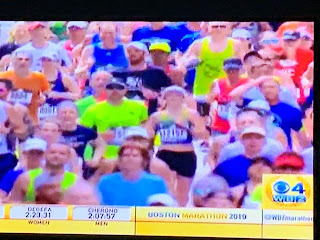 I smiled and waved at the cameras and thanked God for the gift of being able to run the Boston Marathon! I was already warm but I knew it was going to be a great day. I could hear Coach Lee's words as we ran down the first hill at the start, "You need to control yourself." This wasn't an easy task on fresh legs with adrenaline flowing, but I tried to listen. First km 4:36...ugh...that's NOT marathon pace lol. Running was feeling effortless and smooth. I knew that's how it should feel but there was also a lot of down hill. I kept trying to run at an easy effort and each time I glanced down I was seeing 4:44, 4:40...slow down, slow DOWN, SLOW DOWN! I tried to cruise myself into a comfortable rhythm knowing full well that the real race begins in Newton. At 2.5 miles (4k) I actually got to see Spencer! I yelled out "Look at the dog!" to everyone around me. I was so happy to see him. He made me smile big. Thanks Rhea for the photo! The race was feeling good. Despite the humidity I was happy. My body was feeling good. I was breathing with open lungs and my legs were loose. I was running my seventh Boston Marathon and I knew this was a gift. At 5 miles I saw a huge "GRONK" sign and the crowds were singing Sweet Caroline to me. The runners chanted, "Bop bop bop," and I joined in. I was having fun and still feeling good. I recognized fellow Road Hammer Rami zip by me around this time and I yelled out to him. He yelled back and it gave me a bit of pep in my step. A familiar face is always good to see! I kept cruising along and the miles were ticking off. I thought of everyone home who told me they'd track me. I thought of my friends and Matt who were also out there running. How far was he now? Wellesley did not disappoint! I smiled at the cameras, high fived probably 50 girls and smiled big as I saw many people jump to the right to kiss them! Their screams pushed me ahead to Newton. I hit the half in 1:41...too fast. The goal was 1:45 so I tried to be conservative for the next few kms. I was anticipating the big downhill at 25k that Lee warned me about. I knew from past experience that blazing down it was NOT a good idea since the hill at Newton Lower Falls was just waiting there to chew you up, not to mention the series of Hills heading up to Heartbreak. I stayed in control and then made it my goal to look for Tom at the fire station. Suddenly I get bumped on the left arm...I was like "this race is not that crowded and I'm sure bumping me wasn't necessary," but then I realized it was Charlotte! I was so happy to see her and Doran! I did immediately worry that I cruised through the first half way to fast if she was coming from behind. I tried to stay with them and look for Tom but no such luck. This is the first ever marathon photo I've seen of myself taking Gu...I think it's pretty funny. Guys, it was freaking hot in Newton! By the time we got there it was between 12:30 and 1 in the afternoon so you can imagine the sun and humidity coupled with runners heading up the hills. Not a pretty sight. I tried to keep moving forward and stay with Charlotte but I lost her in the crowds. I did see Doran and we tried to run together but it was difficult with the heat and so many people abruptly stopping. At a water station I saw Kristen! She's the woman who designed the crop top I was wearing! We were pumped to see each other. Lee said not to look at my watch in the hill section so I didn't. My goal was just to get to the top without walking so that's what I did. At 30k there was a photo station...My thoughts: "whose bright idea was it to put cameras HERE?" LOL, everyone was toast. At Boston College I was smiling big. Hurting but smiling. My IT band started to bug me and I worried that I would be forced to walk. I still had 9k to run so that was not the best case scenario. I was determined to enjoy the run no matter what so I moved over to the right again and get as many high fives from the partying college students. The smell of beer was so good and so tempting since thirst was taking over. I took water and Gatorade at EVERY station and I was soaked. Hot hot hot hot hot. Oh and sore quads sore quads sore quads. The pain was legit here now. This was the real race. As I shuffled along I suddenly saw a blue and yellow bow bouncing ahead of me and realized it was Charlotte again! We tried to just get to the finish and keep each other nearby. I loved running the final steps of the race with her! Guys, when I saw the sign for "ONE MILE TO GO!" I was shocked. Yes, I was exhausted and hot but I couldn't believe I was about to finish. The spectators were amazing here!!!!!!!! Water cup #98766782340590238 for the day...lol. I see the finish! LOL. I saw the clock and could not believe that I had finally broken the 3:30 barrier at Boston - it only took 7 tries! LOL. 3:27:26. I was so thankful!!!! And apparently I was on TV! LOL. And then Kristen (crop top designer woman) came through the finish! Matt, Marg and I all got Boston Course PBs so we had a great night of celebrating! (3:13 for Matt and 3:40 for Marg!). A huge thanks to Tom for being our Race Crew for the weekend!!! I would never have reached my Boston Goal without the help of my super awesome Coach (Lee) and training friends! Thanks you guys!!!!!! Congratulations to everyone who endured the heat, humidity and hills on Monday!!!!!! You are awesome! Thanks for reading my recap guys...I love when you stop by! Guys, the Boston Marathon is two weeks away! How did that happen so quickly? This popped up as a memory the other day. It was my first Boston Marathon in 2013! I didn't even own a Boston jacket yet...that was the next stop. ;) My friends Nick, Paul and Nadia were with me and we were all very excited! It's been a real treat to experience some real springtime weather. There are all sorts of people out running now, including a lot in the neighbourhood I've never seen before. I have to say my mojo for getting out there after work has definitely increased with less snow and ice to deal with. I'd be lying if I said training was going smooth and easy breezy. I've been so cautious with my IT bands and breathing sort of feels like my lungs have shrunk, even though it was late February when I had bronchitis! Some days are easier than others but running friends always make it fun. Corinne, Charlotte and I after our 33k long run! 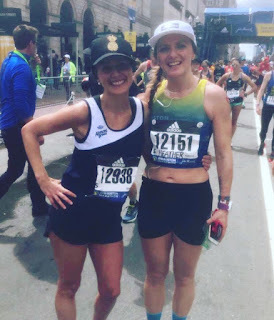 Not sure if anyone remembers the crop top I wore at the Chicago Marathon - but Kristen has designed a Boston Marathon one as well! I'm so excited to get it! And I hope it's sunny so I can wear these glasses from goodr! I've become very familiar in my marathon training at Nova Physiotherapy. Jeff and Jillian are helping me recover and get stronger. And!!!!!! Tiux sent me these super fun Spring/Summer Crew socks!!! If Boston is hot this year I'm totally wearing them. These are called Beach Please! If you want to get yourself a pair of these or the ice cream ones you can use HEATHERLCTIUX at checkout to get my ambassador discount! Okay, as you know teaching first grade is tricky when you are also a marathoner. Little kids love sharing germs...yes, that's a fact. My super awesome running friends Christy and Tash recently rocked the Tokyo Marathon and brought me back these! LOL. But at least I had these girls to clock distance and chat with! Other than the obvious parts where the watch died, this workout made me feel great! Have a great Sunday everyone and thanks for checking in! I hope you are all doing well and by the way, Happy Spring! This race is a great prep for the Boston Marathon, as a physical test. The course is quite challenging and each year I've run it there's been wind in one direction or the other. Getting to the finish line is a feat in itself. Because of the point the race arrives in marathon training I usually run this "race" with caution since my body is at that fine point between peaking and injury. I've suffered achilles issues in the past after running this race too hard. On Sunday morning it was nice not to get up while it was still dark and get ready at my own pace. The Moose Run begins at 10:00, but is quite a far drive for us who live where I do. Even with distance to destination in mind we were still good to roll at 8:00. I hitched a ride with Craig, Stacey, Rachael, Marg and we picked up Charlotte along the way. Some BLT Runners pre-race hanging out. Ugh, sorry it's blurry! Runners register for this free race at the Buffalo Club in Eastern Passage. Donations are accepted and it usually gets a big turnout! Rachael, Stacey, Charlotte and I. Marg where did you go? At 10:00 we headed out to race! Immediately during the first km there was a car in the ditch! This had shaken many runners and I can't even imagine the driver. It was so scary. 911 was called and thank goodness everyone was okay! It was a gorgeous sunny day running along Eastern Passage and Cow Bay! I was grateful for this. So many indecision's beforehand on what to wear! LOL. I started out with Sarah, Corinne, Charlotte and Rachael who were running faster than I was supposed to so I decided to scale it back. The first bit felt easy since there was a good portion of downhill. Christy, Natasha and Natalia were cheering at the famous Moose 4k in! They were so motivating. I saw them again at 10k with Coach Lee and I was getting tired already at that point. Uh oh. Ugh, since recovering from bronchitis I'm having great difficulty running into cool headwinds. I know that's normal but it's also super frustrating. I slowed many times even walking up a couple of the big hills just to catch my breath. Sarah W. and Jillian got some great shots of us! Thanks guys!!! At 12k we turn around and head back. Rami yelled, "There's a nice tailwind going this way!" This helped me so much mentally after fighting a headwind for 12k!!! 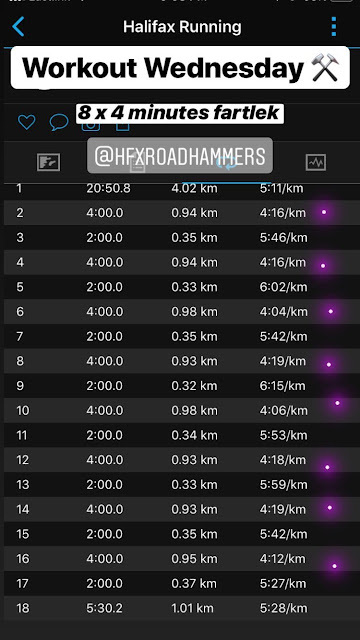 Each time I saw the splits that were slower with inclines or wind I decided that as long as the effort was being put in I'd be happy with the fact that I worked hard. Rachael and I put down a couple of fast kms in the second half and by 20k my legs felt like noodles. This run brings out so many strong runners. The majority were aiming to hit marathon pace that day and it was amazing to see all the runners as you hit the turn around point ahead and behind you. I love that! I knew the race wouldn't be 25k and I really used that as a mental strategy when I was fading in the end. Rachael and I finished in 2:01..nearly 2:02 lol. And I was happy to be done! Marathon training and built up fatigue really isn't a joke. Man, I was zonked! Of course super strong Charlotte was gearing to get our cool down in lol. So we did. Corinne, Charlotte and I did 3.5km to make 32km for the day and then it was time for chilli! The volunteers are so great to feed us!!!! I saw speedy Janet who I train with and she was so strong! And here are the awesome BLT Runners! It was a great run even though I was feeling sub par. Thank you to all the organizers and volunteers! Have a great day everyone and thanks for reading GGR! Hi, I'm Heather and I love to run! I enjoy writing about running, training, eating and other various things. I would love to share my training and racing experiences with you. Happy Running! Tiux Compression Socks Review & IG Giveaway!!!! Blue Nose 1/2 Marathon 2016!!! The 2018 Boston Marathon-One For The Books! The 89th Annual Tely 10!! !